The term “fly-over country” means exactly what it sounds like, those stretches of the Country we have all flown over to get somewhere else, say New York (or Los Angeles if you come the other way). It is a sad phrase, but an accurate description of many Americans’ traveling patterns. For many of us, we have “seen” the Midwest only from 30,000′ at 500pmh. Sorry Iowa, I do like those giant green blocks your State is made up of though. But California has its own “fly-over” wine regions too, except here we drive by them at 80mph. None of these areas stand out to me more than Monterey County. While Lodi or even the Sierra Foothills can claim their own right to the designation “drive-by wine region” (particularly the Sierra Foothills), no place seems more fitting to me than Monterey. regularly sourcing fruit from its cool and dramatic vineyards. From the heaven bound vineyards of the Santa Lucia Highlands, to the hellish landscapes of Chalone and Pinnacles National Monument, how could there not be a little something for everyone here? The very name Monterey has always evoked in me a sense of wonder and exloration. Maybe it was my childhood days spent gazing down at Seaotters from atop jagged cliffs or the monsterous sand dunes I recall from family vacations. There is something very familiar and alluring to Monterey and yet, I barley know the place. My heart says that Monterey has the vineyards of vision, the places that you cannot forget. Yet, so much of what people see in Monterey as they fly by at 80mph on the 101, is the forgetable parts of the region; the thousands of acres of boring vineyards producing boring bulk wines. Aside from a majestic afternoon spent with the very talented Paul Clifton of Hahn, I have yet to come to understand Monterey, except to know deep down that a place with so much climate diversity, and over 40,000 acres of grapes has to do good things. And they do. 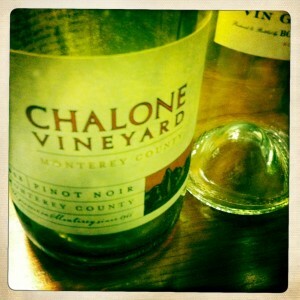 We generally enjoyed drinking through the better part of a dozen wines from Monterey. Although the region has a good showing of varietals, it can take some searching to find anything other than Chardonnay or Pinot Noir, although they certainly exist. 2009 Bonny Doon Vineyard Contra, Contra County – 55.1% carignane, 15.4% grenache, 14.3% mourvèdre, 7.1% petite sirah, 5.3% zinfandel, 2.8% syrah. Vineyards: 79% Gonsalves, 16% Ca’ del Solo, 3% Bella Grace, 2% Bien Nacido – 13.5% alc. 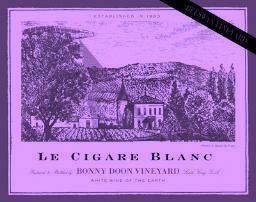 2008 Bonny Doon Vineyard Le Cigar Blanc, Beeswax Vineyard, Arroyo Seco, Monterey – 57% roussanne, 43% grenache blanc from biodynamic grapes – 14.3% alc. 2008 JUSTIN Savant, Paso Robles – 78% syrah, 22% cabernet, 15% alc. Sadly, I found no huge revelation last month with these wines. Quality was generally pretty high, and so the standouts were not head and shoulders above the others as they have been in past months. A few of our previous winners have carried a lot of weight because of the interesting story behind them, or we had some connection with the wine on an emotional level. While we certainly have that with Randall Grahm’s wines, many of the others were unknowns or new to us. Chalone was another exception, however the emotional connection is stronger for many of the winemakers I have met who told me they were inspired by Chalone, than it was with us. That is not to say what we present are shabby wines, quite the contrary. We are in a small monthly wine club at our local wine shop haunt. It has worked out on a few months that one or both of the wines included in our wine club shipment were ferfect matches for The Regions. Such was the case with the 2009 Morgan Twelve Clones Pinot Noir, Santa Lucia Highlands. For a 13.9% pinot, this had nice cool climate spice and a rich dark color. I don’t take very extensive notes sometimes, but it was a genuine Pinot, but more on the lush side of things. Almost every white we had from Monterey was Chardonnay and it was all pretty good (except a terrible Riesling I didn’t even mention). The Bernardus was a hit with our guests at a dinner party for its bright peach flavors, but in the end I got sucked in with Randall Grahm and his 2008 Bonny Doon Vineyard Le Cigar Blanc, Beeswax Vineyard (not Chardonnay, this is Randall Grahm afterall). If you follow me on Twitter (and I hope you do @wkelterer), you know I am a fan of Mr. Grahm. His zeal and vibrant enthusiasm is hard not to like, for us anyway. Added to this, I am a Rhône blend geek, so his offering of 57% Roussanne and 43% Grenache Blanc was perfect for me. On top of that, we worked some internet coupon magic and grabbed three bottles for just over $10 ea.! At 14.3% alc, this white has some flesh too it and is not shy on the nose or palate. However, the wine wears the alcohol well, the way Randall does his spectacles. Monterey, I will spend more time in your vineyards, I promise. This may not be over yet.